The history of # 3845 is not really special. It is not filled with celebrity owners or tragic events. It is much like the history of many Shelbys. It is also an example of what you can find, if you look in the right places. When I restore a car, the first thing I have learned to do is check the numbers and the tags. I also gather up all the documentation and place it in a single three ring binder. Lucky for me, much of this work had been done by the previous owner. The car was well documented, but I was able to uncover a few more items. Let's start from the beginning....In June of 1968 the Meutchen assembly plant created 8T03R210972. It was a yellow, 4speed convertible with a black top. 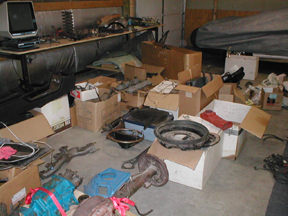 It was immediately sent to AO Smith for conversion to Shelby specs. In November of 1968, the finished Shelby was shipped to Northwestern Ford in Milwaukee, Wisconsin. The yellow car was not alone. 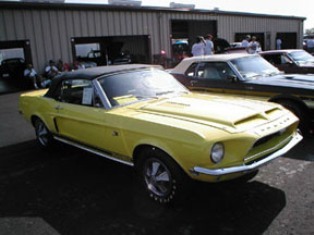 Northwestern had two other yellow convertibles and three yellow fastbacks. According to a well informed Milwaukee native, Northwestern had some problems with theft. One of the things the dealer routinely did was remove the hood pins. These were replaced with a key lock. For one reason or another, a 1967 antenna was also installed. Shortly thereafter, a gentleman named Bruce Weimer stomped in through the Wisconsin snow and purchased the car. Bruce took delivery in January of 1969 and the car hit the streets. Sometime after that, the car was sold to Dan Parmenter in Appleton, Wisconsin. I'm not really sure how long Dan owned the car, but I do know he sold the car to Scott Nehlsen. The year was 1978. Scott enjoyed the car and even showed it locally. The car was a trophy magnet. At some point Scott decide the car need to be freshened up. In 1994, a major restoration began. The car was totally disassembled. 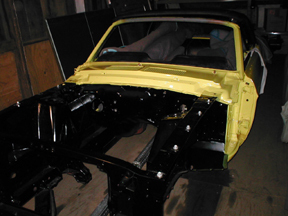 The body work was completed and the body shell was repainted to original factory specifications. To make a long story short, the car was never completed. As a matter of fact, nothing really happened after that. Sometime during the spring of 2001, I was chatting with a guy from Milwaukee. "Have you ever heard of the yellow KR convertible from nearby?" he asked. "Nope" I responded. I thought it was odd. Where was this mystery car? Why didn't I know about the treasure in my backyard? Strangely, within a week I got another call. The same question. Then a third, "chance" call. What the heck, everyone knew about this car. Then, I got a call from a forth person, Scott Nehlsen. Scott was having a little legal trouble. The restorer decided it was time to cut his loses and get out. Scott decided it was time to get his car back. I told Scott I would help him with identification and a list of original parts. Scott was very meticulous and took notes. He got his car back. But, it did take considerable effort. During this time, I was talking to my friends, Bob and Jackie Heineman. Bob showed some interest in the car and I passed along the contact information. Bob struck up a deal and bought the car, some assembly required. He asked me if I could reassemble the car. I was more than willing to give it the college try. Unfortunately, there was one small obstacle. 9/11/2001. I watched much of what happened that day from my couch. I was stunned and I knew the ramifications immediately. I called my boss and told her I was going to be missing a few days of work. I promptly reported for duty with the Wisconsin Air National Guard. What I didn't know was "a few days" would be two years. During this time and the subsquent months, I would be in places like Bahrain, Saudi Arabia, Oman, Kuwait and Israel. Needless to say, not much really got done. Oh, I did work on the car between deployments. In October of 2003, the restoration got serious. The original motor was freshened up. The other original parts were cleaned, repainted and reassembled. In a scene that could have come directly from American Chopper, I worked up to the deadline. Finally after ten years of being parts, it was a car again ! The empty trailer rolled in. The former owner, Scott Nehlsen, hopped out. What? Scott and Bob, the current owner, had become good friends. Scott really wanted to see the car completed. I think he was very satisfied. He looked over the car. "This really means a lot to me. Even though I don't own the car, I really wanted to see this day. The Shelby convention is the closure." Scott took the car to Michigan. Oh, Bob and Jackie were there too. The car won a Silver Award. It was very satisfying for everyone involved. The judging was very tough, but fair. From lawsuit to National Champion # 3845 has made a few enemies, but many more friends.